First Lady Salma Kikwete greets women at Mnazi mmoja grounds in Dar es Salaam during celebrations to mark International Women’s Day. Morogoro/Dar/Dodoma. President Jakaya Kikwete says he will retire a most happy man, having enabled many women to ascend to leadership and key decision-making positions in various public establishments. Mr Kikwete ends his second and last term as Tanzania’s president when the country holds the General Election in October to pick, among other political leaders, a new occupier of the State House. Speaking at celebrations to mark the International Women’s Day held at national level in Morogoro yesterday, the Head of State said the other thing that his leadership is proud of is that of creating an environment for women to get away from a tradition that discriminated them. “I am proud to have created an enabling environment for women’s economic empowerment that has helped to improve their material wellbeing… and it wasn’t like I was doing them a favour, it was their right,’’ he added. Mr Kikwete said for the period that he has been president, he made sure that there was an extended representation of women in various decision-making bodies, noting that it was wrong to disregard women on the basis of their gender. He added that his government has been trying all it could to ensure that it sets a legal framework to weed out gender-based violence and all any other system that infringed the rights of women. “You need to pull up your socks now and move forward because the Proposed New Constitution has included all the rights that you deserve, including gender equality and the 50:50 ration in leadership positions,’’ he said. 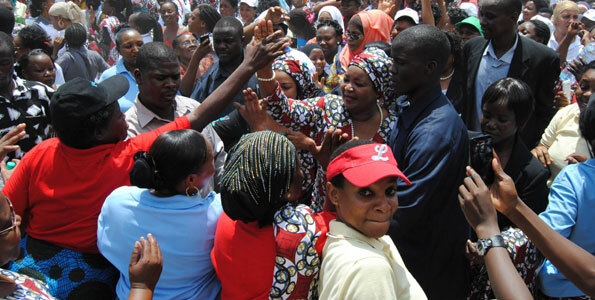 In Dar es Salaam, First Lady Salma Kikwete who graced the celebrations at Mnazi Mmoja grounds, asked women from across the country to vote for the Proposed New Constitution during a referendum, insisting that it was the solution to the myriad of problems bedevilling them. Mrs Kikwete said all women’s rights that are missing in the current Constitution are now on board in the new document. She echoed the president’s observation that on the political front, the proposed Mother Law has proposed a 50:50 power sharing, with women being granted full right on land ownership. While the Head of State urged Morogoro women to vote for the Proposed Mother Law in the forthcoming referendum, Mrs Kikwete asked those in Dar to come up in big numbers to vote even as uncertainty still surrounds its date. As things stand, the authorities appear to be caught between a rock and a hard place—either go to the referendum with incomplete biometric registration or postpone the plebiscite until all eligible voters are listed. Women in Dar es Salaam marked the International Women’s Day with pomp and pageantry. There was a procession that kicked off early in the morning to Mnazi Mmoja grounds where it was received by the First Lady. Dressed in different colours, women in groups marched slowly to Mnazi Mmoja grounds as they sang, danced and ululated. They were led by the Police and Prisons brass bands. Mrs Kikwete became an eye catching figure when she joined the dancing women in a manner suggesting to all and sundry she was fully enjoying the occasion. She was backed by hundreds of women who thronged the grounds. At some point, her security detail had a hard task controlling the crowd in which everybody seemed eager to demonstrate her dancing skills as close as possible to the First Lady. Reported by Hamida Shariff in Morogoro; Katare Mbashiru in Dar es Salaam and Valentine Oforo in Dodoma- The citizen. Next Umwihariko wa Revolisiyo: inkunga yo kwirukana Agatsiko ntizabura ! Ariko nanone si Abazungu bazadutangirira ikivi.